Happy holidays! Today’s board is a special one for us, as it features photos Kim pulled together for her own inspiration, while planning a Center City Philadelphia wedding in the middle of the Christmas season. Once the time of year (mid-December) and location (Philadelphia) were set, I started pulling together a Pinterest board of photos I really loved – and if you haven’t chosen your date or location, don’t miss our how-to posts here and here! I didn’t worry about how well the photos went together, though it turned out that I kept gravitating toward photos with similar aesthetics – classic, sparkle, candles. S and I went through many, many rounds of color schemes, which involved me creating lots of Keynote slides with 5-6 color swatches and then the two of us narrowing down to the ones we liked best. We definitely liked the combination of white and gray, but weren’t sure if black would be too dark in the space (it wasn’t), whether to go with silver or gold (we stuck with silver), and how much, if any, accent colors to add (ultimately settling on a tiny bit of red, in my bouquet, though we originally thought about red or dark pink centerpieces). We both wanted the overall feel to be both classic and modern (that is, nothing too minimalist or too overdone). I very much wanted a holiday-inspired wedding, without having anything overly Christmas-y. The touches of glitter – and, especially, the candlelight – were our nods to the season. 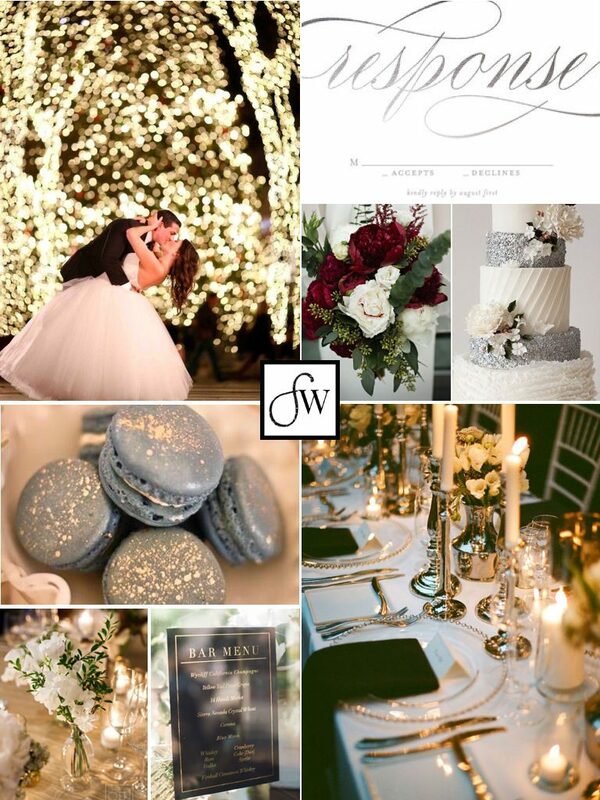 If you’re planning a winter wedding, we’d love to hear about your color scheme! Leave us a comment below and let us know what you’re thinking.